Learning to drive is one of the most important rites of passage in life. Along with learning to drive the car, it is also important that the student learns the importance of service as well. Getting a back to school checkup and servicing will be a great time to teach about car maintenance basics. 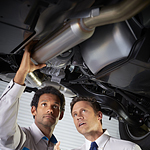 Scheduling a service appointment should be a part of the yearly back to school checklist. It is also a great time to go over things such as how to change a tire, use the safety equipment, where the spare tire is located, and to familiarize them with the owner’s manual. This will not only teach them good car maintenance practices, it will also make them a more confident driver because they know their car is in good working order. Stop by Savage Kia and start down the road to good vehicle service habits.